Our Life Size Peel and Stick Wall Decals are a perfect addition to any room. Use them in bedrooms or print your company logo or slogan and use as office decor. Our Wall Decals are also great for FUNDRAISING! Print your school mascot for your home, locker or vehicle! Removable wall decals are safe for most wall sufaces, but are best applied on flat smooth surfaces. 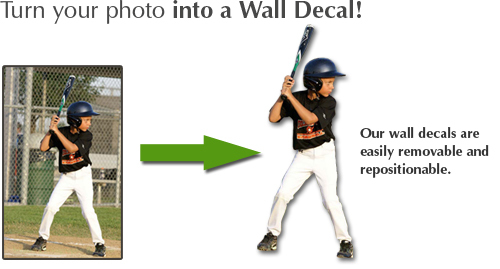 Enlarged photo is printed on high-quality fabric and trimmed into a life-size decal. Contact us for additional sizes, pricing and fundraising options. 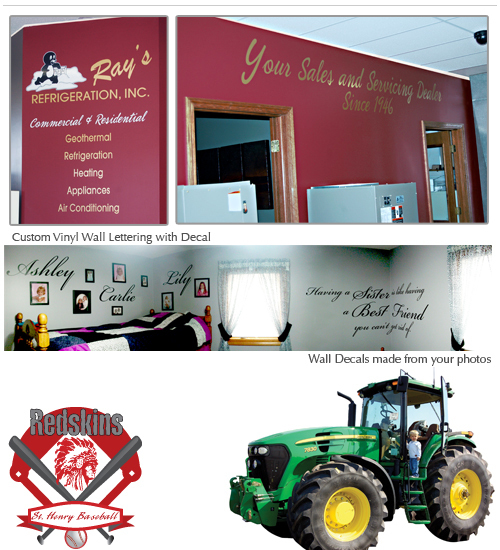 Our Vinyl wall decals and lettering are a perfect addition to your home or business! Create custom quotes or business slogans, as well as corporate logos for your walls, windows or vehicles.